Wasting, also known as wasting syndrome, refers to the process by which a debilitating disease causes muscle and fat tissue to “waste” away. The main character in the story is Sophie (Lauren McQueen) who suffers from an eating disorder. According to Wikipedia an eating disorders are excluded from causes of wasting. So, the film is inaccurate in its title. When the film opens, the title – ‘inspired by true events’ is splashed on the screen. But how true the events depicted in the film can be another thing. The story is set in a small English town. The film has 4 main teen characters so one can assume that teens are the film’s target audience. The four youths, two girls and two boys have similar looks. So, it takes a while before one can distinguish one from another. Best to remember their names and associate the face to the name, or the film can get confusing. 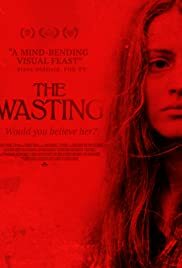 Sophie is an anorexic teen struggling to come of age, braving sexual awakening and fighting her controlling father, Ilyas (Gary O’Brien) by refusing to eat…until a nightmarish ghost appears that may be real, or may be a deadly creation of her starving body. As Sophie battles for truth, sanity and survival, a dark family secret surfaces that will either save her or destroy her. The secret surfaces only during the last half hour of the story. Sophie is visited in England by her best friend Grace (Alexz Johnson), her boyfriend Kai (Brendan Flynn) and Sophie’s boyfriend, Liam (Sean Saunders Stevenson) from Toronto, Canada. Sophie’s father is reluctant to have Sophie hang around her friends and goes ballistic when he finds that Sophie has a boyfriend. While all this is going on, Sophie starts having nightmares and seeing apparitions as result of her not eating. Her father blames her friends and her friends blame the father. Liam claims he loves her but she sees a ghost in Liam which draws them apart. The conclusion would be the outcome whether Sophie will be able to untangle her relationship with her mother’s ghost, going back to leading a normal life or be forever drawn into her madness. The film still works regardless of the result as director Saunders has confidently and effortlessly drawn her audience into her characters’ world. The film is a Canadian/U.K.co-production premiering first in Toronto.